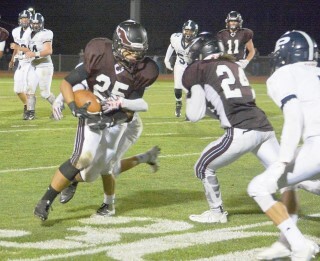 Friday the Windham Eagles suffered their first loss against conference rival Portland Bulldogs home. 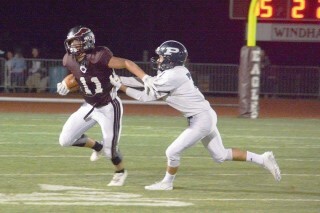 Prior to Friday’s opening kickoff, Perkins said, “I feel good about tonight’s game. Everybody is healthy.” As it happens, they were ready. For the first 5 or 6 minutes neither team would give an inch. 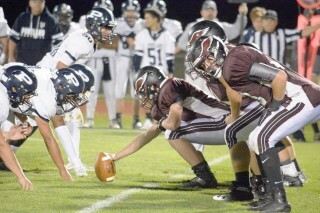 Portland however would strike first and by the end of the first quarter led 14-0. 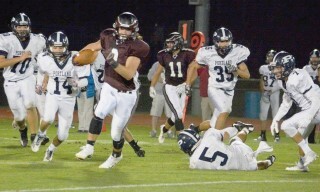 The second quarter saw Windham make a comeback. With the score still 14-0 the crowd came to life when Eagles running back Nate Houser scored on an 11-yard run with 1:40 left in the half and that’s how the half would end with the Eagles close at 14-7. At the half adjustments had to be made. “The biggest adjustment that had to be made was cleaning up the mental mistakes. There were two personal fouls that ended up being very costly. But that’s what happens with a young team, there is no other way around it. You have to get over the humps and move on. There were a lot of blown assignments but that’s part of learning,” explained Perkins. However, the second half would go in Portland’s favor. By the end of the third quarter it was 28-7. After scoring one their touchdowns several Portland players flapped their arms, a la Eagles, in the direction of the end zone bleachers. Surprisingly and much to the dismay of fans no penalty was called. “We all have different philosophies on how we run our program. I’ll leave it at that,” said Perkins of the unsportsman-like conduct. Eagles Blake Houser would respond to the taunt, dishing out his own brand of justice by breaking five tackles on a 94-yard touchdown run on the ensuing kickoff. Then the Eagles struck again three minutes later after stopping Portland on downs. A very short punt by Portland on their own 15-yard line was retrieved at their 21 by Cameron Hoffses, who returned it to the 1. Two plays later Desmond Leslie would cross the goal line with 3:19 left in the game, Windham had at last closed the gap to a just one score. 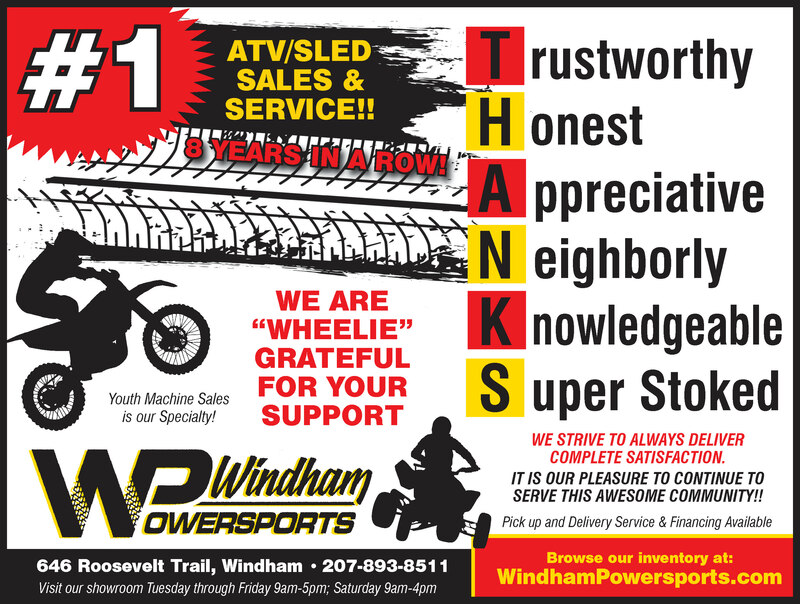 However, 28-21 would be the closest Windham ever got. Forced errors and poor judgment by the young Eagles team would lead to two more Portland touchdowns, ending the contest with a final score of 42-21.